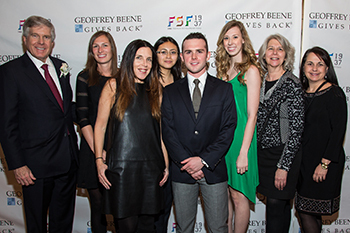 Three Syracuse University seniors have been named 2015 YMA Fashion Scholarship Fund (FSF) Scholars, an honor that includes a $5,000 scholarship. Abbey Doneger, Delaney Estoclet and Marla Rosen, the Doneger Group; Indradevi Nuon, David Kern, and Kate Johnson, SU’s 2015 YMA FSF Scholars; Maryanne Moore, the Doneger Group; and Rose Marie Crisalli, SU program manager and YMA educator at the YMA FSF awards dinner. Kate Johnson, a public relations major in the S.I. Newhouse School of Public Communications; David Kern, an advertising and finance major in the Newhouse School and the Martin J. Whitman School of Management; and Indradevi Nuon, a fashion design major in the College of Visual and Performing Arts each won a $5,000 scholarship from the YMA FSF and were honored in January at the YMA FSF Geoffrey Beene National Scholarship Awards Dinner in New York City. The scholarships are awarded based entirely on merit, taking into consideration the applicant’s GPA, the completion of a case study project, a personal essay and an interview with a YMA FSF ambassador. SU’s ambassador is Abbey Doneger, president and CEO of the Doneger Group. Founded in 1937, the YMA FSF is an international nonprofit organization composed of influential members of the fashion industry. The FSF’s goal is to advance the fashion industry by encouraging gifted and enterprising young people to pursue careers in design, merchandising, retailing and business so the industry will continue to attract dedicated, capable and creative individuals. For more information, visit http://www.ymafsf.org.